Several sets of test projectiles have been constructed as detailed below. The projectile lengths have been set to equal the test coil length of 25mm and are radiused at the front end. The projectiles are machined from free cutting mild steel bar. The powdered matrix projectiles are made from filings of the same alloy. There are four projectiles of each type. The reason for this is simply good experimental practice. By using a group of test objects you can be more certain that the results obtained are indeed typical of that object type and not in fact a statistical anomaly. 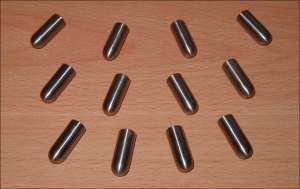 These projectiles are simply solid steel rods. This is the most basic type of projectile. These share the same profile as the SP's but have a hole running along their axes. The purpose of the CP's is to study the effect of loading on the coil. In all cases the core is drilled to a depth of 20 +/-0.1mm. Slotting the projectile reduces the possible eddy current paths and so increases the dynamic flux penetration. Projectile under development. By using a powdered core virtually all projectile eddy currents are eliminated. These may give an insight into whether eddy losses are a significant issue in projectiles. Projectile under development. Ferrite offers a very high resistivity which almost completely eliminates eddy currents. This type may prove better than the powdered matrix projectile in extremely fast coilguns. Note that ferrite is very hard and very brittle. The stuff is tricky to machine, I managed to turn a projectile from a piece of aerial ferrite rod but it blunts HSS lathe tools in a matter of minutes.